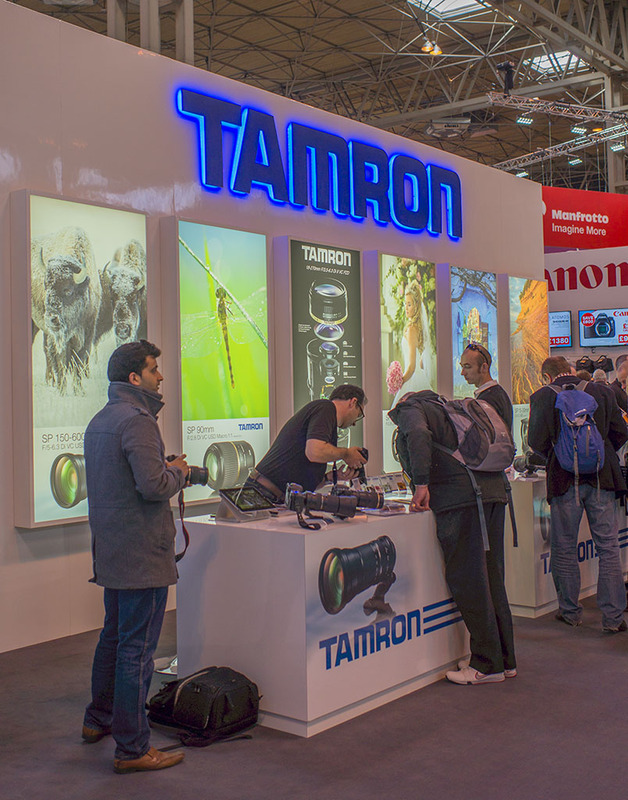 The Photography Show, the UK's biggest for Photographic products and Photography, at the National Exhibition Centre in Birmingham was a short 1/2 hour drive from where I live. This has replaced 'Focus on Imaging' and after a somewhat muted start in 2014, this year pulled out all the stops. A bigger hall, lots more exhibitors and stands and large crowds of people. The figures may show a steady decline in camera sales, but walking round the show and seeing the number of photographers eager to try out the new stuff and talk to the reps, I got no sense of that. I was surprised by the size and scale of this years show and the overall enthusiasm for photography. The various retail outlets were incredibly busy, with people often 2 deep and having to wait to part with their cash. I didn't manage to escape with my bank account intact but more of that later. However, first and foremost for me, it was an opportunity to meet Heather and Mathieu from Mirrorlessons again. We had lunch and chatted about things photographic and internet journalistic. As before I was impressed by their dedication to the cause and the hard work they put in making their site one of the best out there. As you can see they managed to raise a smile after spending four days interviewing, reviewing and building up their contacts. Now UK based, they are turning their site into a great source of information about mirrorless cameras and the photography those cameras can create. As ever I have no hesitation in recommending their site to you. It's one of the most intelligent, objective and well written photographic review / blogging / comparison sites on the photographic internet. I applaud their ambition and their desire to constantly evolve, expand and improve and they are really nice people as well. The show this year was notable in attracting all the major photographic manufacturers apart from Samsung. Including of course, exhibiting here for the first time in 10 years, Leica. I was great to see the red dot featuring prominently and I particularly liked the cameras in glass cases displayed like works of art, which of course they are. The three market leaders, Nikon, Canon and Sony had huge stands as did Olympus and Panasonic. The Fuji stand was somewhat smaller as was Ricoh / Pentax, but they were both attracting lots of visitors which was good to see. I'll be writing more about what I saw and what I think the implications might be for our common passion in the next few days. I'm also putting together videos from the footage I shot to give an impression of what the atmosphere was like. As I wrote earlier some of the figures relating to overall world wide camera sales are somewhat depressing. Eventually those may well impact on what we get offered in terms of new gear and perhaps more importantly, what it costs us. But there is probably no doubt that the boom days for digital camera gear are gone and we have to wait and see what kind of level camera ownership settles at. Perhaps an indication of where things are going is reflected in what I came away with. Apart from ordering a new Billingham bag, surrounded by almost every kind of camera and lens I left the show as the owner of the 'camera' below. Whether this says anything about the state of photographic equipment in 2015, where it's going or more about me and my preferences is a question I'll explore in the subsequent articles. But this is what I bought.